Phones don’t swim. Neither does your MP3 player or your camera. In fact, they don’t even like the rain. But accidents happen -- your smartphone slips out of your hand, bounces off the dock and into the ocean. With a waterproof case from Aquapac, if your favorite electronic device goes in the drink, you won’t lose it. Aquapacs are completely waterproof and surprisingly functional. You don’t even have to remove your devices to use them. You can talk on the phone, change the music or even take pictures while your device is in its protective case. And the cases float, so if the Aquapac that’s holding your keys, money and passport winds up in the lake, it will float on the surface until you can fish it out (not every device stays afloat in its waterproof Aquapac, so you’ll want to test it first in a bucket of water at home). Two patented Aquaclips are what make these cases truly waterproof.The design dates back to 1983, when three London windsurfers wanted to listen to their Walkmans while they surfed. Today, Aquapac is headed by CEO Tim Turnbull and offers a range of cases, including a phone case and multipurpose cases for your wallet, keys and other items. The camera case comes with a hard lens so you can take pictures underwater (photo above was taken underwater using Aquapac’s camera case), and the case for MP3 players comes with waterproof headphones, so a downpour won’t derail your run. You’ll be singing — or talking or taking pictures — in the rain with Aquapac’s waterproof cases. Hello from Tim Turnbull, over the pond in the UK. 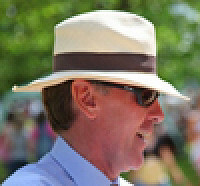 I’m the CEO of Aquapac International. Our headquarters is more than 3,000 miles off the East Coast, a good five time zones away, but through the magic of Grommet technology I hope I’ll be able to shoot a quick response back to any questions you may have. I'll try, anyway, and if I add a "u" in a word like "colour" or "humour" you'll have to allow it. At Aquapac we make a whole load of different waterproof cases. What you’re seeing today is a few of them. I think each one is definitely cool and most assuredly waterproof. Take our camera case for the point-and-shoot camera, designed so you can take your existing point & shoot into the Great Outdoors, and use it, with no worries. We invented the technology for these cases. It’s patented. And we’ve won quite a few awards for it including a Queen’s Award for Innovation (that’s from our Queen Elizabeth II). We get everything checked by the engineers at Imperial College London which is one of the world’s top mechanical engineering schools. The camera case is guaranteed waterproof to IPX8 which is the toughest international waterproofing there is. And we offer a 3-year extended warranty to demonstrate confidence in our materials and manufacturing quality. Hopefully you’ll find everything you need to know here, but please do feel free to ask me any questions and I’ll do my utmost to answer them! Wow! These Aquapac products are going to be a lifesaver this Summer. Every year my family takes a long houseboat trip which is great-- but there is little cell phone service. When someone does have to make a call- we have to take our cell phones on a Sea-Doo into the middle of the lake and try to find a spot with service. We have lost MANY cell phones doing this. The Aquapac is definitely going to come in handy for us! I love the camera bag. Our last trip to the beach, I wanted to get those great surf-crashing-over-my-children pictures, but I couldn't really get in there because the splash would have gotten my camera. I don't quite understand how the lens works. Do you have to leave your camera on a certain setting for it to work with the lens? Above the waterline, no, just use normally. If you're snorkelling and want to take pictures underwater, it's best if you can to set the camera to infinity. Get as close to your subject as possible. Be as still as possible. Closer the better because water is full of microorganisms that light reflects off, the closer you are the fewer between you and the subject so the better the picture! It takes a bit of practice to get good piccies underwater. And a bit of luck! But it's amazing the quality you can get. And all with your own camera! I can see putting many of these to good use! You've just opened up the possibilities for anyone who is around water! Somewhere in my house, I have a waterproof disposable camera, from a trip four years ago, with only half of the film used that I keep forgetting about! To have been able to use my trusty digital would definitely have been the way to go. Tim - that story of someone losing their camera and it turning up days later is a great story. What other grand adventures have your Aquapacs taken? Grand adventures, Katherine? Well, loads really! They're taken on expeditions all over the world by famous explorers. Roz Savage who just became the first female to row single-handed across the Pacific Ocean, she takes them everywhere. They're used by rescue services, for example the L.A. Life Guards. And we have received letters saying that by allowing people to call for help Aquapac has saved their lives. That's pretty gratifying! @Bethany - wow!! Maine to Key West is quite a trek, what a way to explore the East Coast! @Tim - yes, very gratifying! Just to back up Tim's comments, I have an aquapac for my ipod which I use when I swim. Easy to use, and absolutely no water gets anywhere near the ipod-it's a fantastic product! Am also buying one for my son's insulin pump this summer so we can take him to the beach without fear of damage!! loved today's Grommet! and I know quite a few people who could really use them ! Thanks, Bethany Nicola and mcc! Appreciate your kind comments! Tim -- Thanks for joining us from London; we are touched that you will join us going into your evening. And we had a blast testing the Aquapac products -- everyone wanted to test them out themselves. Each tester came back with their own fun stories and you can see from the video -- no damaged electronics/valuables. I'll be here as long as you need me. Happy to answer any and all questions. It's after 7pm here in the UK so I may be responding from my favourite pub soon. Will be even happier! Love that technology. Now I just need to get out of this office and out to the beach so I can employ it! Nice highlight Grommet!! I searched far and wide as a professional watersports photographer to find waterproof camera gear that is rugged, light weight and really protects my kit. Cost was also a driving factor for me and faced with $4200 bill for Ikelite stuff I went for Aquapac and now I have most of their range, it really is fabulous. We have packs on our boats, in our cars and even the kids have them for their iphone. who would have thought you could go snorkelling with a phone and take photos and videos of dolphins!!! Im really fussy about quality but these products are 100% spot on. I have purchased 3 Aquapacs this summer and they're GREAT! One for my Canon SLR, one for a small point and shoot or my iPhone and one for my Kindle DX. Sturdy, easy to pack and use, and definitely high-quality. I had sent an email to the company with a question and received a quick, helpful response from Tim. Little did I know at the time it was the CEO! Great product, great service, great company. @Lisa - that's good to know that these have worked out for you! Tim is a super-great guy and that friendliness permeates throughout the company. Thanks for stopping by! I vouch for these 100%, and use them on a regular basis. @Fat Head Carl - thanks, that's good to hear!! I looked high and low for a water proof case for my camera to take on vacation. I decided on aquapac and was delighted! This pouch is perfect for my point and shoot Canon camera! We were so happy with how it kept the water out and allowed us to take the best underwater shots while snorkeling! It is also so much more affordable than the other options to make our camera waterproof and it we were still able to keep it in our pocket! Thank you so much for a great product!! @Ellie - we are glad that these lived up to your expectations. Thank you for coming back to post! This is the second time that we've featured Aquapac products and have carried over the conversation from the first time. We are here to answer any further questions or comments that you have! These Aquapacs are great. I use one daily in the summer with my iPhone for sailing and hanging around on the beach. Two bits of advice: (i) attach some buoyant items like boating keychains or sunglasses lanyard floats on the cord so it wont sink if you drop it in the water (!) and (ii) be a little gentle with it - I was a bit rough with my first one and it developed a small tear/leak. @Christopher Mirabile: Thanks for the advice, Christopher. It's good to hear back from seasoned Grommet users. Happy sailing! @Beth: Yes, the medium for a Kindle. I see some relaxing summer days in your future! Agreed, Aquapac is certainly a product that can make your brain start ticking with all the possibilities it would allow. "Fits most consumer SLRs with standard lenses, including all bodies which use an APS/DX sensor, and some smaller bodies with full sensor. Canon 5D & 1D, Nikon D3 & D700 are too big, sorry." Here's what another Aquapac Staff member says "I have a Canon 500D 55-200mm which travels around with me and works really well in this case." Will the MP3 case fit an iPhone? I want to be able to use the waterproof headphones with it. @Kristen: Yes, the MP3 case will also fit an iPhone so you can take advantage of the waterproof headphones as well! Have fun. Really not loving this. Water time is nature time, quiet time. We need to be careful as to not forget to smell the flowers which are close to the water. Thanks. @JoAnna Cousins: You're right, it is important (and so nice!) to be completely unplugged sometimes. We think the Aquapac products have the potential to enhance an experience in nature, too. Bringing a GPS along on a boat ride might lead you to a new cove you've yet to discover. Bringing a camera down a river with you might allow you to capture an image above or below the water line that will remind you to get back to nature in the future. If anything, someone might feel a little safer bringing their phone on the water with them, even if it's off and tucked away. We all need to be reminded to stop and enjoy the scenery. Thanks for the reminder! I have an "otter box" protective cover on my Iphone which add quite a lot of bulk. Will it still fit in the small case? @Elizabeth Rosen: We're not sure about the size of your case, but here are the dimensions that the Mini Whanganui Electronics Case will fit. Hope this helps! @Katherine Klinger: I just measured my iPhone in it's defender series otter box and it measures just over 6 1/2in around. So the small case probably would not work. Lengthwise is under 5 in. Hope that helps your readers. @Kerensa: Thank you! That is helpful. Will the mini fit the imain x speaker (the one with rechargable battery)? I'd like to get the speaker to protect it from water while boating. If it fits, I've got my husbands Father's Day gift wrapped up. @ Lisa p: The dimension of the iMainGo X is 3.8" x 2.4" x 5.7". The Mini Whanganui Electronics Case is just slightly smaller with length of 5". It's a great idea but the case is not going to work for the iMainGo. BTW, in general, you can find info of the dimensions etc in the DETAILS tab (under the video) on the featured Grommet page. If you have not, check out our Father's Day goodies. We hope you'll find another wonderful gift for your husband here. What length/diameter lens will the SLR case accommodate? I read the listing above, which I had missed first time down, thanks. I purchased an Aqua Pac for my old iPod that I use exclusively for listening to audio books. I love audio books, and I love distance swimming, so Aqua Pac with waterproof headphones is a product I have waited for all my life! I live on a farm with a large creek that feeds into the Missouri River (on the Lewis and Clark Trail) -- it's an amazing place to swim laps. I am now swimming a mile a day and am just six pounds from my goal weight for my daughter's wedding in two months. I tell everybody I know about this amazing product! Phones don’t swim. Neither does your MP3 player or your camera. In fact, they don’t even like the rain. But accidents happen -- your smartphone slips out of your hand, bounces off the dock and into the ocean. 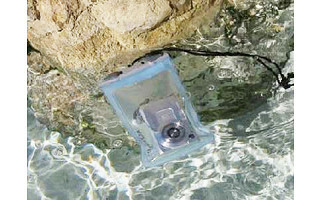 With a waterproof case from Aquapac, if your favorite electronic device goes in the drink, you won’t lose it. Aquapacs are completely waterproof and surprisingly functional. You don’t even have to remove your devices to use them. You can talk on the phone, change the music or even take pictures while your device is in its protective case. And the cases float, so if the Aquapac that’s holding your keys, money and passport winds up in the lake, it will float on the surface until you can fish it out (not every device stays afloat in its waterproof Aquapac, so you’ll want to test it first in a bucket of water at home). Two patented Aquaclips are what make these cases truly waterproof.The design dates back to 1983, when three London windsurfers wanted to listen to their Walkmans while they surfed. Today, Aquapac is headed by CEO Tim Turnbull and offers a range of cases, including a phone case and multipurpose cases for your wallet, keys and other items. 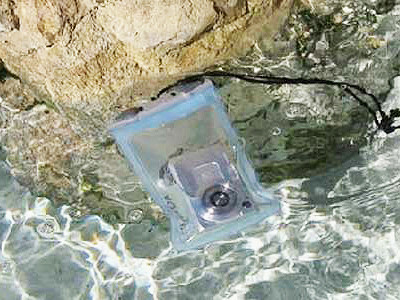 The camera case comes with a hard lens so you can take pictures underwater (photo above was taken underwater using Aquapac’s camera case), and the case for MP3 players comes with waterproof headphones, so a downpour won’t derail your run.